Believe it or not, after floating through a couple decades of development hell, giant shark movie The Meg is finally about to surface in theatres this summer. Based on the novel by Steve Alton, the project has been through a handful of directors over the years including Guillermo Del Toro and Eli Roth, only to end up with National Treasure director Jon Turtletaub. Go figure. With the success of recent shark movies like The Shallows and 47 Meters Down, this has the potential to be a big hit, but based on the trailer it also feels like the big bloated studio version of something that should be small and sleek. Then again, it’s hard to resist the basic draw of Jason Statham taking on a giant shark. 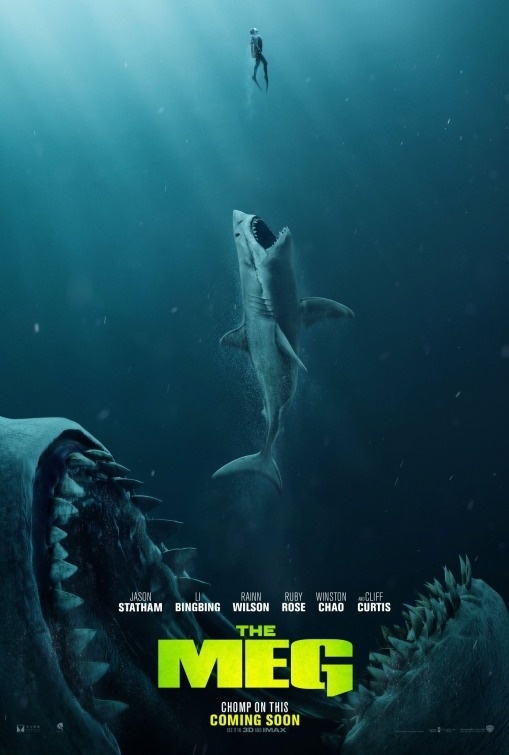 The Meg co-stars Bingbing Li, Ruby Rose, Rainn Wilson, Jessica McNamee and Cliff Curtis and it hits theatres on Aug. 10th. Check out the first trailer after the jump and let us know what you think. Looks fun to me. Can’t go wrong with the Tauber. This will provide the most idyllic drive-in theater experience this summer. No, no, no, Sean. This film looks so tongue-in-cheek that it’s going to be amaze-balls !!! I think Verhoeven was attached at one point too, but now we get the (probably PG-13) Jon Turteltaub version. Great. Movies like this are the real reason I got Moviepass. Movies live again! !, just what the doctor ordered and action movie that clearly isn’t taking itself too seriously. Let me see…Giant Shark, Giant Squid, Hotties Ruby Rose and Li Bingbing, actor Rainn Wilson and Action star Jason Stratham….ok I’m in! Oh and this better be rated R! I heard REED is a big fan of Li Bingbing..but gets a lot of the asian female actresses confused with one another. Ha ha why am I not surprised to hear that when it comes to REED! I myself am not all that familiar with Li’s work though I do know of her. She is definitely some nice eye candy but I have no idea if she is a good actor. I think she is also a singer as well. Oh man I would loved to have seen a Verhoeven giant shark movie! What a missed opportunity! Plus I was hoping it would be R but yeah you’re probably right it’s gonna be PG-13. I think she’s been in a lot of movies, but I haven’t seen her in anything where she gives a standout performance. She was good in Resident Evil as Ada Wong. I hope you’ll be able to be a part of THE MEG podcast Reed. Would like your opinion of the crossover acting between Western and Asian Cinema. Is it good, or usually performances lacking? Oh, I might have that Resident Evil movie on my pile of movies to watch. I have never seen an Asian actor in a good Western movie. I don’t think there’s ever been an Asian director who’s directed a good Western movie. Some peeps will probably bring up Ang Lee’s “Brokeback Mountain.” It was okay. Began watching Resident Evil Retribution. Quite fun. I like Paul W.S. Anderson’s films. Li Bingbing is dubbed, but I suppose this fits in with this being a video game adaptation. When you step away from hollywood movies for ages and you come back, you really get the feeling that nothing has changed since the fifties. Exposition science dialogue feels like it could be from the creature of the black lagoon or something. “It’s a living fossil!! !” Just atrocious.